Cardinals manager Mike Matheny answers a question from a reporter during a media availability at baseball's Winter Meetings in Lake Buena Vista, Fla.
LAKE BUENA VISTA, Fla. — As much as Mike Matheny likes the addition of the newest Cardinals, he admits that both acquisitions come with complications. For shortstop Jhonny Peralta, there’s the stigma of being suspended for performance-enhancing drugs. For center fielder Peter Bourjos, there’s the man who played center last season, Jon Jay. Both newcomers have plenty to earn come spring training, particularly Peralta in light of criticism from outside players after the club handed him a four-year, $52 million deal. If Matheny has his way — and you can bank he will — Peralta won’t have to deal with negativity in his own clubhouse. 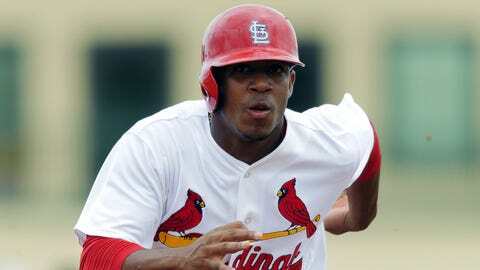 Matheny said he has been impressed in his communications with Peralta as well as from reports from Detroit about the kind of teammate the soft-spoken 31-year-old Dominican is. “There are other people out there that may not like our stance and think of us as hypocritical. So be it,” Matheny said. “But for us, we see a guy who made a decision that he regrets. He didn’t fight to pay the price. He paid it. Now we’re part of his future. Regarding the projected change in center field, Matheny stopped short of anointing the newcomer Bourjos as his everyday guy. While Matheny admitted that Jay might “have lost a step” compared to his play in 2012, the manager has liked what he has heard from Jay since the Bourjos trade. 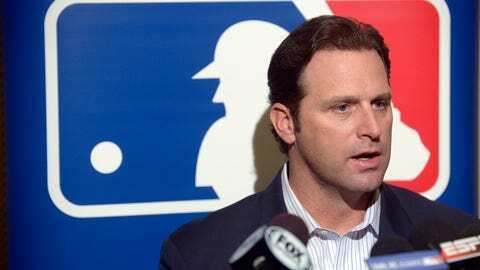 Matheny’s first full day at the meetings was a busy one as he made his appointed rounds for assorted media outlets to address the addition of the newest Cardinals for the first time. Wednesday won’t be much slower. During a meeting of all general managers and managers, Matheny will take center stage to state his case for banning collisions at the plate. If he gathers enough support — and momentum is building — a rule change could be implemented by the start of 2014, according to Mozeliak. The Cardinals are on board for the change, if for no other reason than to protect Yadier Molina. At the session, scheduled for four hours, MLB executive Tony La Russa is scheduled to roll out specifics on the workings of expanded instant replay, which is expected to be in place by Opening Day. Mozeliak said he doesn’t remember the last time all the GMs as well as managers convened for such a meeting. “Historically, we don’t even have meetings when we’re here,” he said. ** Jaime Garcia might not have locked up a spot in the rotation, but he holds the key to one. His recovery from shoulder surgery was so far along when the season ended that Mozeliak said the lefty is having a normal off-season and is expected to report to spring training with no limitations. ** The club is close to announcing the hiring of former Cardinals third baseman David Bell as assistant hitting coach. The St. Louis Post-Dispatch reported Tuesday the club had identified Bell as Bengie Molina’s successor but Mozeliak declined to confirm the hire because administrative hurdles still need to be cleared.